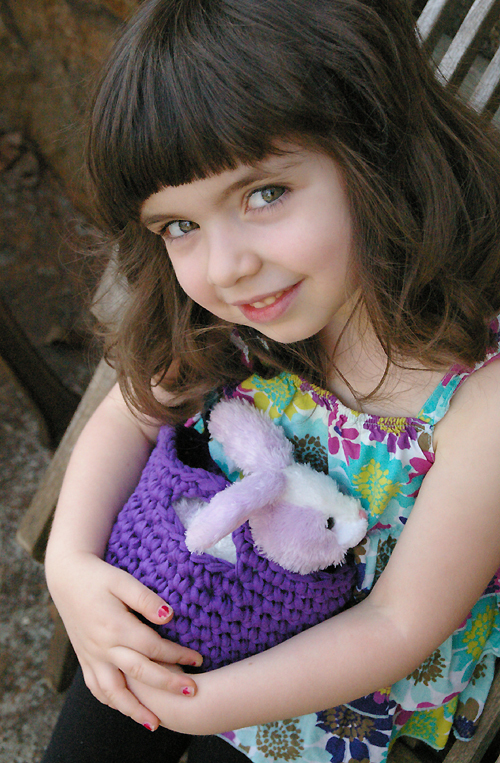 It’s made out of “tee cakes” yarn, which is really fun, chunky, and recycled! I made it over the course of about 2 hours or so, and I’ll be sharing the know-how in an upcoming class at Knit New Haven. It only required chaining and single crochet, and a nice fat US N hook, so beginners will love it. 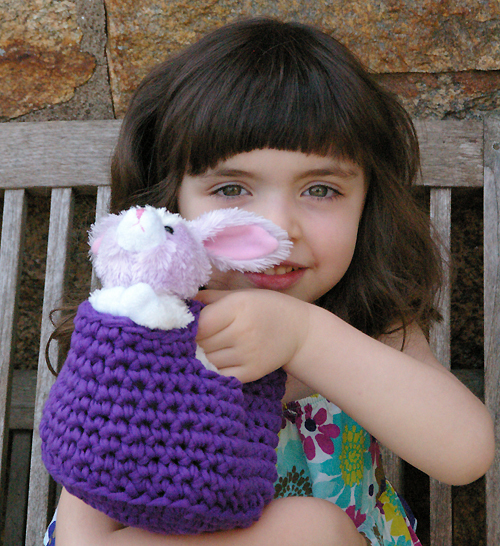 Of course Lil One immediately saw the petite dimensions and concluded she had to have one to tote around all manner of bunnies and things. I finished it and immediately thought how cute it would be as a slip cover for a potted african violet for Mother’s Day. My Grandma, who taught me how to crochet, would have loved to dress up her favorite flowers in colourful little crochet baskets. Did I mention it’s made out of recycled tee shirts? Washable, cotton goodness. In any case, it was an easy project, and I’m sure it would make a great presentation or caddy for any number of things. Lil One is a super stuffed animal mommy, can’t you tell? Just don’t know how I’m going to pry the sample away from her… perhaps I can squeeze a second one out of the leftover yardage tonight.